"...no time is wasted, their limited farming fields at the slope of the mountain become productive all year round." Along the road in the mountain town of Cervantes is an endless mountain scene. At first I was thinking if what are the industries that people are engaging into in this town. I was not even thinking of farming because obviously there are no fertile plains to plant crops. 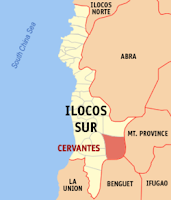 But it is not about the fertile plains because the people of Cervantes can really make a way. They are not just making a way, they are also maximizing that "way." I was at a higher elevation -- a road constructed almost at the top of the mountain so I am able to see this breathtaking encounter from above. 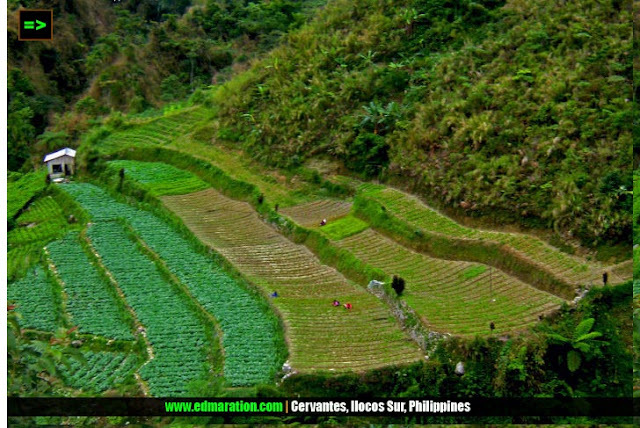 It is not a Highlighted rice terraces compared with those located in Ifugao. Only a small portion of the mountain was converted into huge green ladders. At first look you know it is not at all a green huge ladder for rice and at the lower parts, there is deviation. This mountain farmers are making use of their limited farming space into maximum. So, they plant crops all year round. That's why it is not always rice that is being planted in this small parcel of farming field. I learned from a friend who hails from Cervantes, Ilocos Sur that during rainy seasons, these mountain farmers plant rice and during summer, they plant vegetables. And for that matter, no time is wasted, their limited farming fields at the slope of the mountain become productive all year round. You have just read an article about the mountain farmers, you may want also to read our article about the river farmers. Click here. Yan ang mga Pinoy - madiskarte! Mabuhay kayong mga Ilokano! This is your 6th secret comment coming from me. God provides everything. And what everyone receives is for him/her to make use of it. Since these farmers in Cervantes are living in a mountainous place which is too difficult for them to level it up. Therefore, they have to accustom to it and earn for their living. I like these people for their resourcefulness and ingenuity. "Kung ang taong nagigipit, sa patalim kumakapit" more likely this is it! Yan ang galing ng Pinoy. Mapatubig o bundok --- walang hindi susuungin mabuhay lang. Salute to this farmers. May our government give them the assistance they need. by the next generations to come. I've notice this situation the first time I pass by the highways of Benguet.. Almost every available space, even roadside can be planted with vegetables. i am always at awe with the rice terraces and how they were able to make use of their limited space...galing talaga ng mga pinoy! It's good that they've preserved the rice terraces. They've been able to cope up with the hindrances, the locals are truly amazing! True! They are the backbones of our society and economy. may rice terraces din pala sa ilocos!